Universal Gatherings - Synchronicities !!! After The past 3 Years with Amazing Success & Good Vibes , We bring you another Psytrance Gathering that will Start your Summer Off Right !!! The Intentions behind this Years Gathering is Synchronicities. Many things happen to Us in our Daily lives , Every Minute , Every Second, Every Day & Every Week. All these occurrences are not by mistake - EVERYTHING IS SYNCHRONIZED !!! When we start Putting the Pieces of the Puzzle Together , We start to realize that Everything is EXACTLY the way its supposed to be !!! Mark your calendar and forget your other plans for this weekend because this event will be the highlight of your Summer . The event will be $130 cash at the gate & We will have bathrooms and other amenities for your convenience. All families are invited - We love having children at our gathering . We consider this to be one big family and what would a family be without pure children filled with love . We love all Living Beings but Please leave your PETS at home. We are sorry but this is the land owners rules. THIS IS A LEAVE NO TRACE EVENT ! PLEASE RESPECT THE NATURE AND EARTH THAT GIVES US EVERYTHING !! There will be a Community Bonfire Burning all Night Long ! 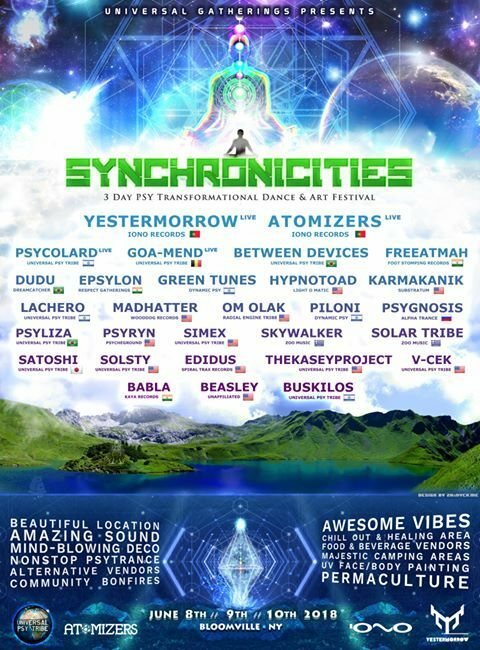 We will be playing Progressive Psy , Full-On Psy. Nightime Psy, Morning Psy & GOA !!!! LONG LIVE FREEDOM & PSYTRANCE !! !